The trail points for the first three trails are now available. The first table is the pace points where you race against yourself and you start getting points after you have completed more than one trail, highest points are awarded to those who are improving on their pace. The second table is the overall championship points. On Sunday 18 November, 50 runners gathered at the Seaview hotel for the John O’Groats trail run. This trail run has very little road sections and offers the runners amazing views, which helps keep your mind from focussing on how windy it was and how tired your legs are. The long course of 6.5 miles was completed by 44 runners and saw Greg Shearer claim his second win of the trail series completing the course in 42 minutes. The first female cross the line was Hannah Patterson in 54.18. The short course of 4 miles was completed by six runners, with Paul Steven coming in first in a time of 37.08 and Claire Helliwell being the first female crossing the line in 44.14. For a lot of North Highland Harriers members the Statkraft Winter Trail Series is the highlight of the runing calendar. This year we started the series at Baillie Wind Farm on 21 October. It was a cold and blustery morning for the first trail with either a 2.3 or 5.1 mile option available. Baillie is run mainly on the wind farm tracks and offers some tough hills throughout. Forty runners completed the long course with Greg Shearer finishing first in 29.28 and first female finisher was Hannah Patterson in 39.08. Three runners completed the short course with Fiona Stockan coming in first in 22.10. On the 4 November we returned to Olrig Hill, which was re-introduced last year to the trail season after some time in abeyance. The clue to what to expect is in the trail name, and in addition to the main hill offers a number of other uphill sections. This is a tough run but the view from the top of the hill on a clear, crisp autumn day was worth it. The long course was 6.7 miles with 34 runners completing this run. Kenny MacGruer came in first in a time of 42.35, with NHH’s head coach Sophie Dunnett leading the ladies in a time of 56.36. The short course of 4.6 miles was completed by 8 runners, with Paul Steven being the first finisher in 36.45 and Sarah Armitage the first female in a time of 41.56. The Baillie Wind Farm results can be found here and the Olrig Hill results can be found here. Next year the Castle of Mey 10k will be held on Sunday 26 May. Entry won’t open until mid February, but get the date in your diary now. Sunday 21 October is the start of this year’s trail series at our sponsor Statkraft’s wind farm at Baillie. There are two course on offer, the short at 2.3 miles and the long at 5.1 miles. Registration is from 9.15am to 9.45am, with the first runners off at 10.00am. Parking is available close to the start / finish area within the wind farm. The entrance to the wind farm is on the Shebster (back) road to Reay from Thurso. If travelling from Thurso it is a right hand turn, about a mile from Shebster, there are various signs at the entrance. After taking the right turn, drive to the top of this road and take a left towards the start / finish for the trail. All donations of cakes and and sandwiches are most welcome. Please take them along with you on the day. The results for the Caithness Half are now available on the Caithness Half page of our website. Congratulations to all the runners on a very warm Caithness day. Many thanks to all our volunteers today, without who the race would not happen. This Sunday North Highland Harriers are holding their first Caithness Half Marathon. The event is SA permitted and is run in and around the village of Watten. Registration is on the day in Watten Primary School from 11.30am – 12.30pm, with a race start of 1.00pm. Costs are £10 if you are a SA member, £12 otherwise. 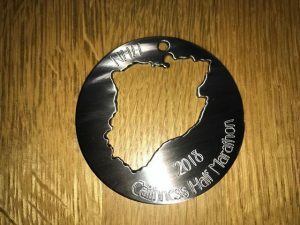 A custom made medal for all finishers. There is only 3 weeks to go to the Caithness Half Marathon. Registration is from 11.30 – 12.30 in Watten Primary School with the race starting at 1.00. All details for the race can be found under the Caithness Half menu item.